We were looking forward to seeing Zimbabwe again after nearly 30 years. We knew things had changed, of course, and we weren't sure what to expect. We finally entered Zimbabwe on March 23, but we think of the trip as beginning with hassles we endured in Johannesburg and Pretoria. We arrived at Margie's in Johannesburg on the afternoon of the 19th, after an uneventful drive from Nelspruit. Margie's part-time maid, Maybe, was still there to let us in. Maybe is a Zimbabwean who is soon retiring and moving back to the Bulawayo area. On the morning of the 22nd we were on our way to Zimbabwe. Unfortunately we got lost Pretoria trying to find the Home Affairs office for more paperwork connected with the loss of our (stolen) passports. 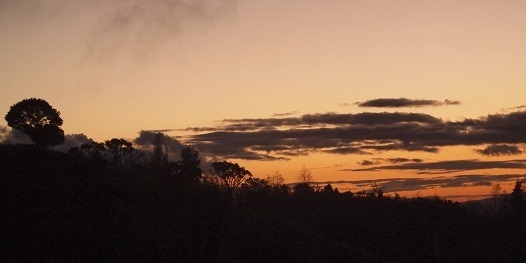 We ended up camping for the night in Louis Trichardt, Limpopo, an hour or two south of the border. On Saturday, the 23rd, we finally made it into Zimbabwe. The scene at the border was fantastic. On the Zimbabwe side, there were any number of lines to wait in, forms to be filled out, fees to pay, and so on. We'd been warned that it could easily take over four hours. And we had no idea of the correct procedures. That's why we fell easy prey to one of the touts at the border crossing -- young men who offer to help tourists navigate the system in return for fees. This is something of a cottage industry, a chance for enterprising people to scratch a living based on the inefficiencies of the system. Some of the touts perform worthwhile services, but others want you to pay for phony, unnecessary paperwork. The young man into whose clutches we fell was somewhere in between. He relieved us of quite a lot of money -- more than $50 -- but on the other hand, he filled out forms, dashed from queue to queue, told us what to do every step of the way, and got us through the border in about 45 minutes, well before 2 p.m. On balance, it was probably worth it. Still, it never feels good to be hustled, so it wasn't the best start for our time in Zimbabwe. We were heading for Masvingo. How, then, did we end up in Bulawayo? Amusingly, Comrade Mugabe had hundreds of road signs removed before the last election so that foreign journalists would not be able to find their way around (true) and the big Harare signs were still gone! We ended up on the wrong road and didn't realize it until we were stopped at a police checkpoint -- by the way, all the police have been friendly and polite -- and learned that we were already closer to Bulawayo than to Masvingo. Left: Back in Zimbabwe at last! At a Bulawayo gas station, we asked a youngish white woman if she could suggest a place to stay. She called her father and set us up in a cottage on his property. What a place! 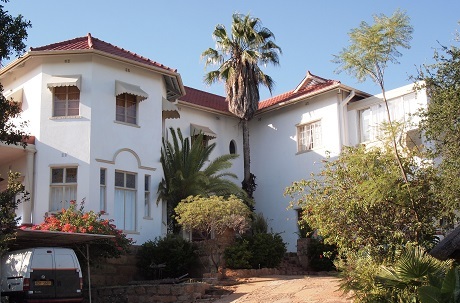 The main house (right) was one of the oldest in Bulawayo, and it looked like we'd stepped back into the glory days of Old Rhodesia -- except that Darren Cummings and his British wife Helen were progressive and were committed to living in a multi-racial Zimbabwe. They showed none of the uneasiness and even disdain that so many South African whites clearly feel toward Africans. They made us feel at home, and it was a pleasure to meet and talk with them. Darren and Helen installed us in a thatched cottage just below the main house. It was very comfortable, and Helen even brought us a beef stew in the evening so we wouldn't go to bed hungry! And so our first day back in Zimbabwe ended much better than it began. On Sunday we left Bulawayo and drove to Masvingo, but not before spending an hour on the terrace with Darren and Helen, who shared some of their feelings about Zimbabwe. Here, it's enough to say that they were positive -- both about the country and about the African Zimbabweans with whom Darren works. It was a refreshing change from otherwise similar conversations in South Africa. One of the first things that struck us on the drive was the generally decent quality of the roads. 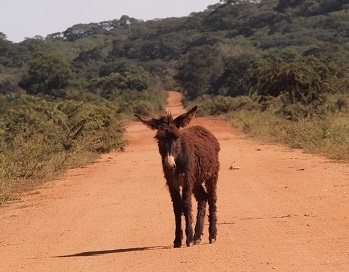 Down south we'd been warned that Zimbabwe's roads had deteriorated dreadfully. While that seems to be true of some dirt roads, the paved roads were mostly up to Vermont standards. Mostly. On this drive, we had another encounter with the ZRP (Zimbabwe Republic Police.) We were stopped at a roadblock, and a young officer walked up to Barbara's window (she was driving at the time) and said, "Sorry, I have to arrest you." Barbara probably noticed a smile in his eyes and replied, "I don't think so!" Then they both laughed. Imagine that! A cop with a sense of humor. 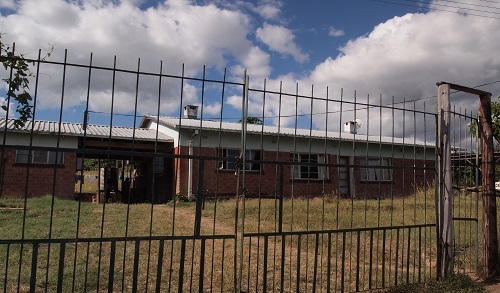 In Masvingo, which was a little more run down and a lot bigger and busier than we remembered it, we first searched out the Zienzele House. It was easy to find, once the cab driver we asked was able to decipher my pronunciation of "Ebony Street." We left a note for Prisca and Nancy and then headed to Norma Jean's Lakeview Resort, on Lake Kyle near Great Zimbabwe. We weren't sure quite what to expect at Norma Jean's Lakeview Resort, but it turned out to be only a little more expensive and a lot nicer than we'd imagined. Monday morning we left Norma Jean's and traveled on a dirt road around Lake Kyle. It was supposed to be the quickest route to the main road east toward Birchenough Bridge. 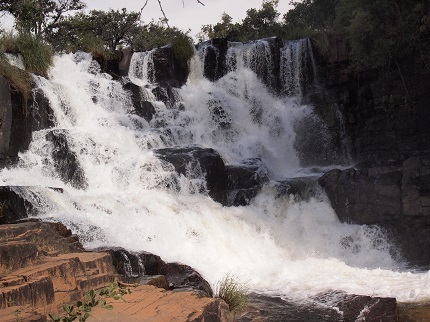 We missed a turn somewhere, since instead of 16 kilometers on dirt, we drove twice that, along the Mtirikwi River. Eventuallty we found the tarred road to the east. When we were driving near Lake Kyle, we couldn't help being stunned by the low water level. There has been a serious drought in this part of Zimbabwe, and people are already hungry. 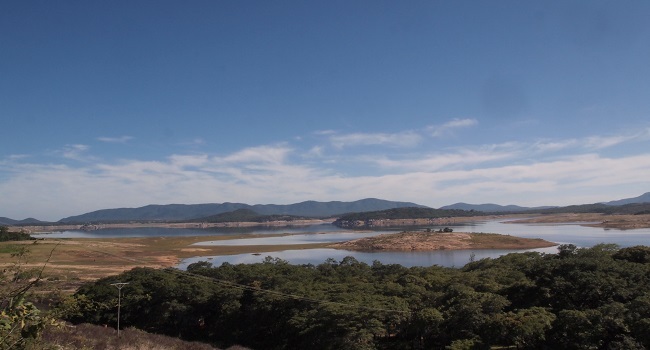 Lake Kyle is the principal reservoir for this region, and there's clearly a danger that it could go dry before the next rainy season -- eight months away at the time this photo was taken in late March (below). We traveled through dry country marked by koppies -- rocky hills -- sheltering subsistence farms. 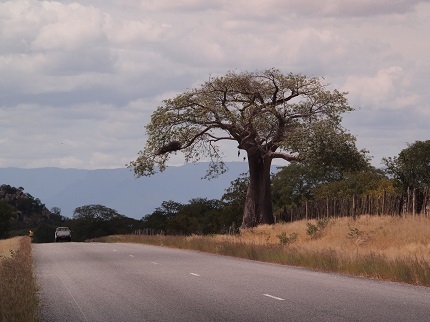 The countryside grew drier and hotter, and baobab trees appeared as we neared Birchenough Bridge and the Save River. Look carefully for huts nestled among the koppies. 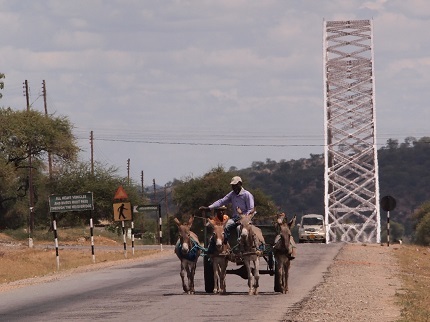 When we crossed Birchenough Bridge, it was still late morning and we were undecided where to go next. 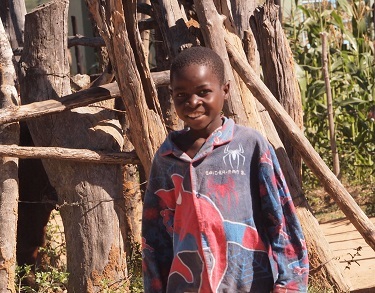 Our choices: Look for Steve Rounds' cousin, teaching somewhere near Chipinge; go to Chimanimani and camp in or near the national park; or drive straight through to Mutare. At first, we decided to head for Chipinge. This was a part of the country we'd never seen before, and we were amazed at how lush and productive it can be. Along the way, we were stopped again at one of the many police checkpoints, and this time it seemed we might really be extorted. Wally's seatbelt was off -- he'd been in and out of the car taking photos -- and the policeman said he would not ticket us; we could just pay $20 cash. Barbara, who was driving, said she wanted a receipt, thinking this might stop him, but he called her bluff. Then she tried another ploy: "We came to Zimbabwe to teach just after independence ... " and it worked! Instead of paying a fine (or bribe), we got helpful directions and information about the condition of the frontier road from Chimanimani to Cashel. 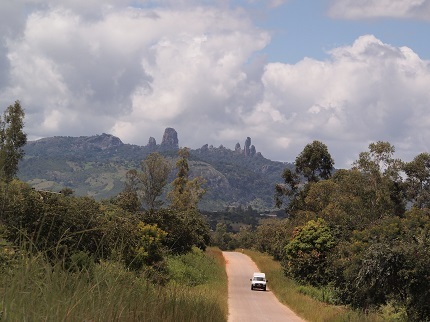 On the way to Mutare, we drove through the spectacular Skyline Junction, (right), and later we stopped at Mutambara Mission, where we first taught 30 years ago. There had been many changes. A World Vision office is now headquartered on the mission. The school is still running, but overall it looks a little more ragged around the edges than it did when we were there. 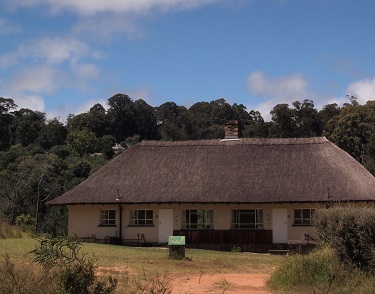 Our house at Mutambara. It was nicer 30 years ago, and without the fence. 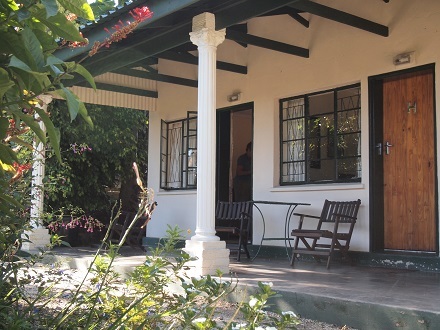 We ended up spending our first night in Mutare at the old Wise Owl Motel, still operating if a bit run-down. Barbara never likes staying in motels, and this was no exception. Late in the evening, Wally drove into town to fetch pizza, and that only made things worse. We awoke to a nice surprise on Tuesday at the Wise Owl Motel. When we first stepped outside, there were men washing all five or six cars in the motel parking lot including ours! We forgot about the kind of service that was expected by the Rhodesians and is still sometimes offered even today. There's a difference now, however: When the motel workers saw us bringing out a camera along with other gear, they wanted to have pictures taken. The result is on the right. What a good-natured group they were! 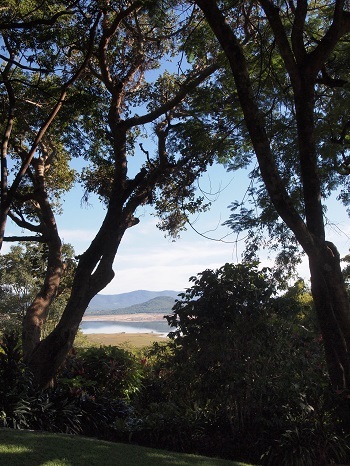 From the Wise Owl we drove out to the Vumba Mountains, one of the most beautiful, greenest parts of Zimbabwe. 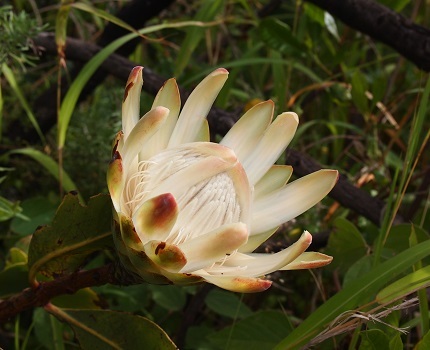 We planned to visit the Vumba Botanical Gardens and stay in the campground there. 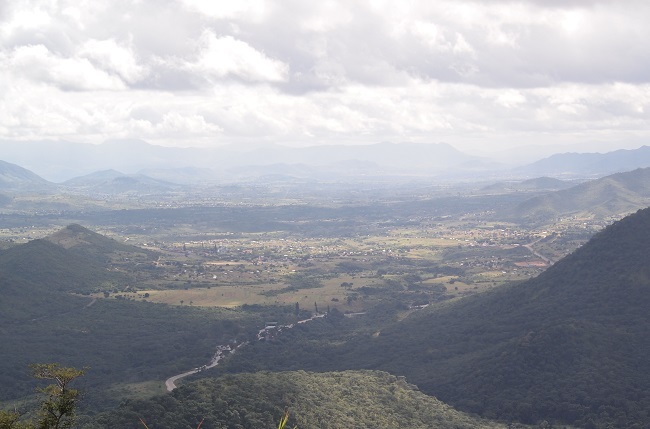 As we started to climb into the mountains, just outside Mutare, we stopped at the first overlook (below). We enjoyed a long conversation with an African businessman who was waiting there. Among other things, he talked about the Zimbabwean people's work ethic, violence and guns in South Africa, profit margins for businesses in Zimbabwe, partial takovers of businesses as a result of new government policies, and more. 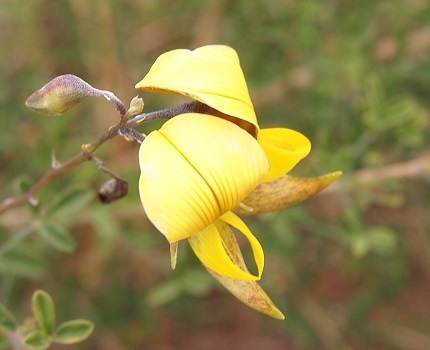 We found the Vumba Gardens in sad shape. The campground we remembered was not functioning, and there wasn't any other practical place to camp. We looked for the Campbell-Morrison estate, where we used to rent a cottage occasionally, but we were unsuccessful. 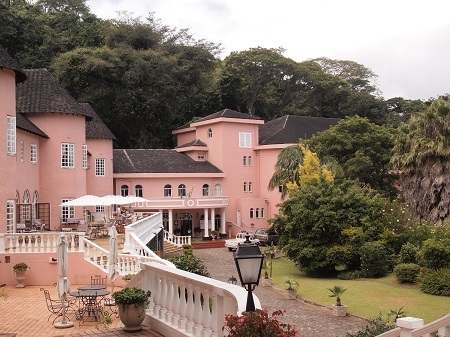 Finally, we visited the Leopard Rock Hotel. 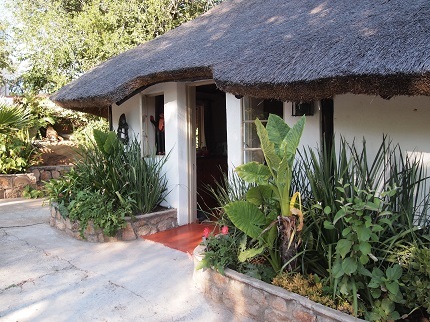 Though it's not to our taste, this is one place in Zimbabwe that has retained every bit of its colonial splendor. Of course it was far too expensive for us to even consider. 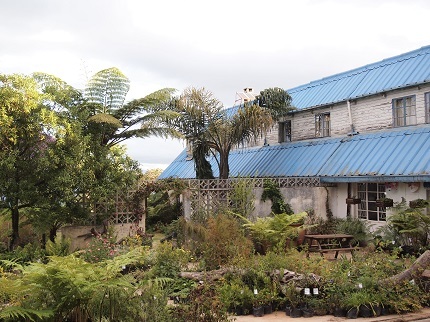 Luckily we also found Hivu backpackers and plant nursery, a ramshackle accommodation, but with a nice double room and a splendid setting. 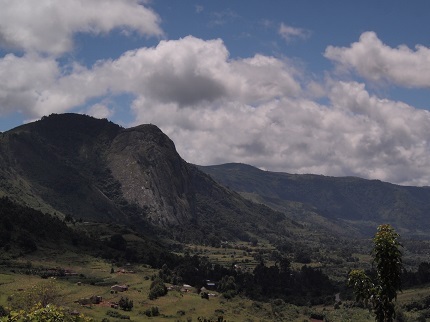 We dropped off all our gear and went back to Mutare at lunch time. We also went to Tsvingwe Secondary School, where we taught for over two years, after Mutambara. It is now much bigger and it offers some A-Level classes. 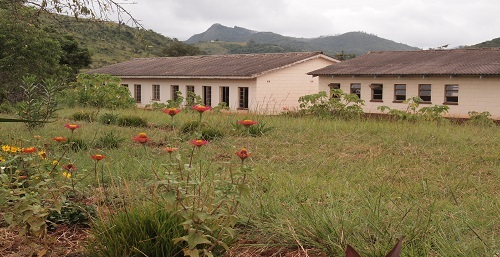 However, Tsingwe seems even less well furnished than when we were there, and we don't know about the availability of textbooks, which is a huge problem at many of these rural schools. Classes had been dismissed for the day when we arrived, and only a helpful secretary was there. We talked to the new headmaster on the phone and he wanted us to visit the next day, but that wasn't possible. 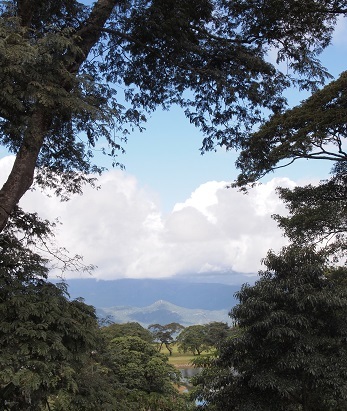 Then we returned to the Hivu Backpackers for the night, driving through rain, mist, and fog -- remnding us that this is, indeed, the Vumba Mountains. 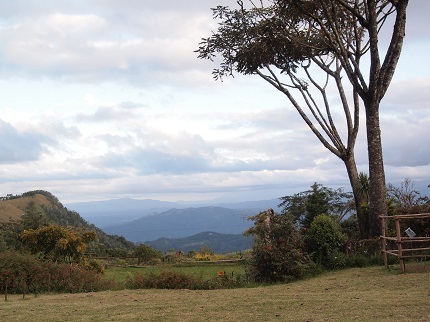 Backpackers in the Vumba upon our return. On the way to Nyanga (left) we stopped at the Claremont orchard. We remembered a day about 30 years ago when we had a longing for apples, so we rode a small motorcycle all the way to Clarement to buy some. Amazingly, the farm stand we remembered is still there, the large orchards are still in business, and the apples are still delicious. Although you no longer have to drive this far since they are available in the larger supermarkets in Mutare and Masvingo. 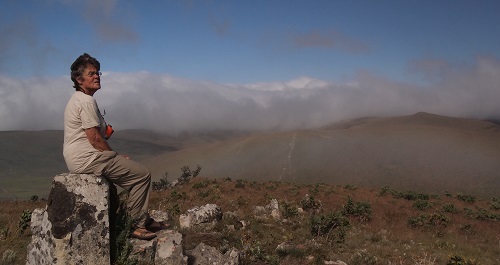 We reached Nyanga National Park by mid-day. It was expensive! It cost $30 U.S. for us and our car just to get in; the smallest chalet was $80 US. (These are rates for foreigners.) We dithered about what to do. 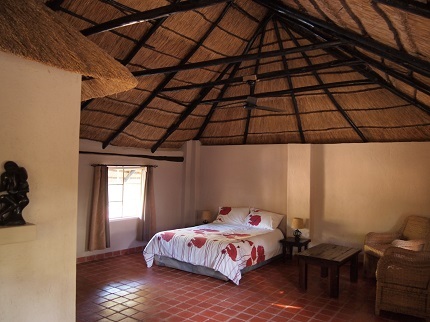 We drove to Nyanga village but didn't see anyplace to stay that promised to be any cheaper. After a long walk to Nyangombe falls -- still as beautiful as we remembered -- we finally decided to go for broke and stay in a national park chalet. The chalet (right) was in excellent shape and extravagantly spacious for two people -- though there was only a big bathtub, no shower. It had a fine little kitchen, living room with fireplace, and bedroom. The only real flaw: even though the place was immaculate, there was a problem with herds (swarms? armies?) of tiny ants. 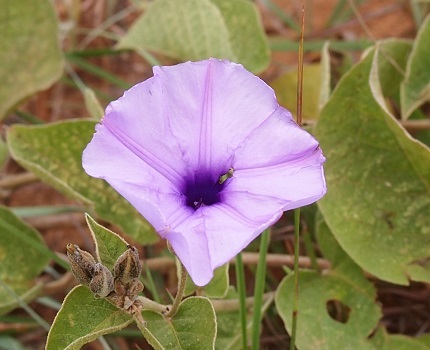 Luckily they were not biting ants. In the evening we drove deeper into the park on a rough dirt road looking for a viewpoint to enjoy sunset and full moonrise. Wally worried about destroying our little car, but we did find a nice spot for sunset. 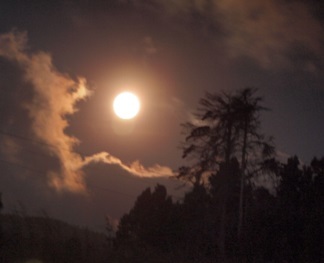 The moonrise was unfortunately hidden by hills, but we eventually saw it emerge dramatically from behind the clouds and trees. We made it back to the chalet in the dark. 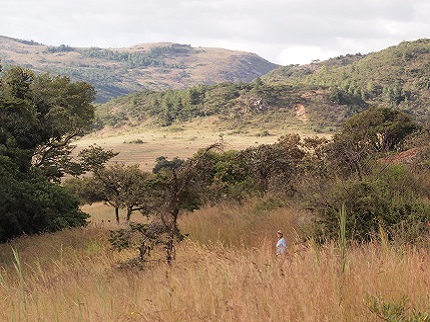 On Thursday we had to return to Mutare and the Vumba, but first we made two wonderful side trips. First, we drove deeper into the park again, around a rough circular track that approaches the base of Mt. 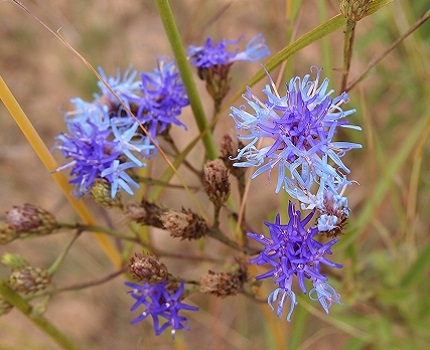 Inyangani. 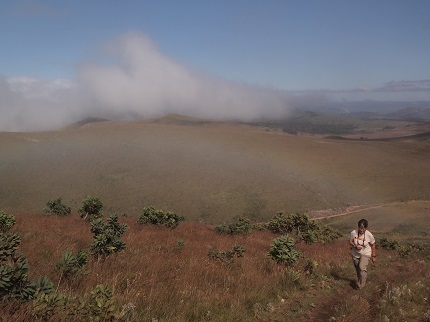 This is the highest point in Zimbabwe, and it's haunted by legends about hikers disappearing. There's some basis for this, partly because of a notorious kidnapping of tourists that occurred near the end of the liberation war, but more generally because of Inyangani's weather. 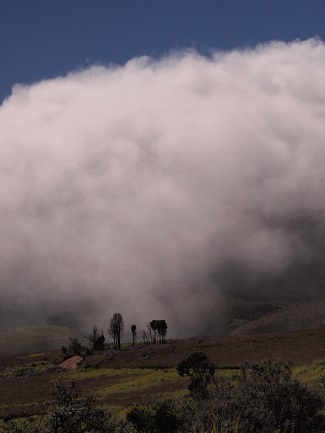 It's not unusual for clouds to suddenly envelop the peak, reducing visibility to zero and making it impossible to find ones way. 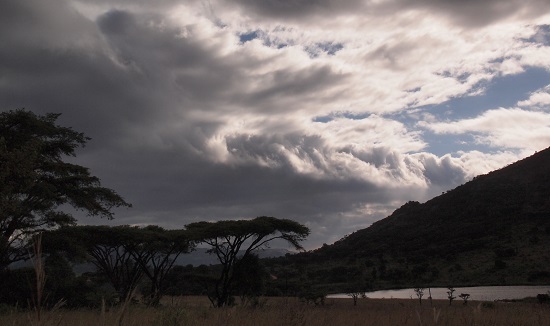 There were plenty of clouds when we arrived at the mountain, and we had neither time nor clothing nor inclination to hike to the top, but we did enjoy the cool, breeze-swept heights. 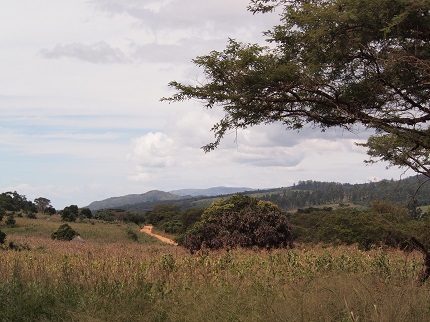 On the way back to Mutare, we also drove down into the Honde Valley. The road from the Nyanga highlands into the valley twists down, and down, and down. It's like landing in an airplane; ears pop! 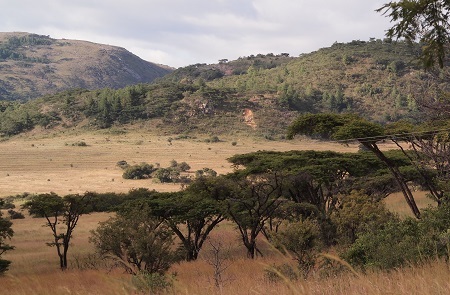 Of course the climate is much different down in the valley: It is warm and humid, and distinctly tropical vegetation contrasts with the grassy, open spaces and pine-clad hills of Nyanga. The valley seems to be densely populated, probably because of the productivity of the land. We noticed unusual numbers of people standing on the roads; at first we thought it was another sign of the high rate of unemployment. 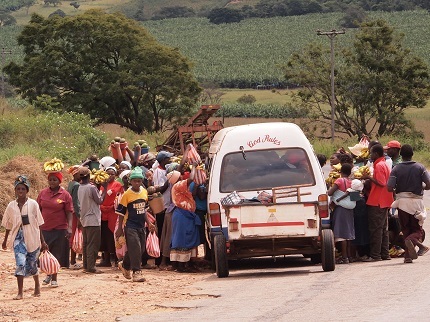 Then we realized it was the start of the Easter holiday, when more people travel around Zimbabwe than at any other time of year. 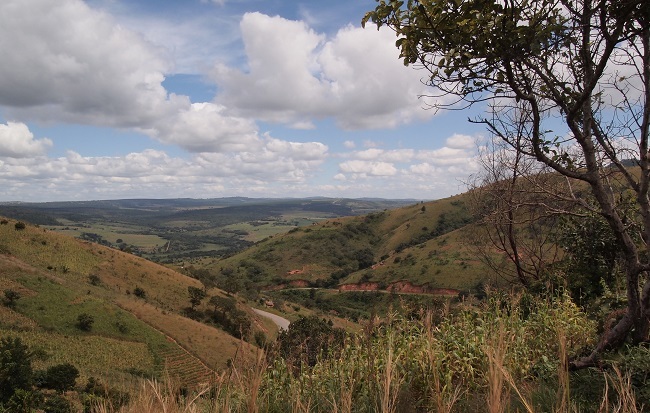 Riding down into the Honde Valley on a bicycle would be one of the most exhilirating experiences we can imagine on a bike, but climbing back up would be sheer horror. Nevertheless, there were very many bicycles used down in the valley for transportation from one valley location to another. The very few people we saw taking bikes up out of the valley were pushing them. 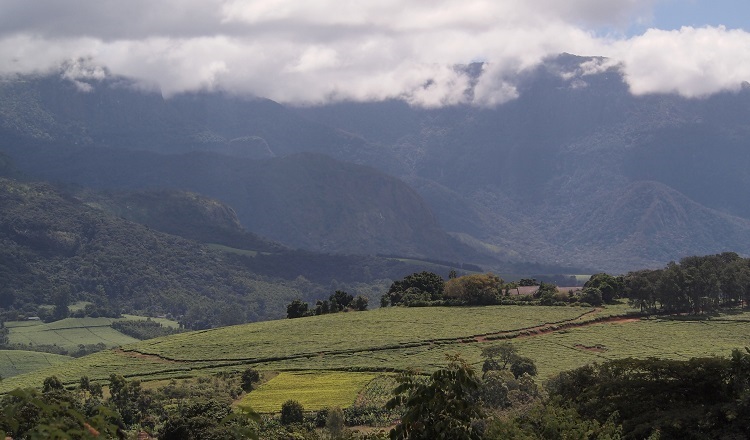 From the Honde Valley, we drove back to Mutare. 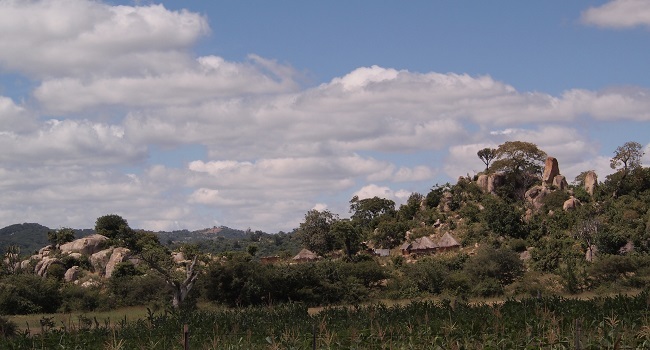 The next day we went on to Masvingo, where we were to stay for a couple of weeks and visit the Zienzele Foundation's projects in the Berejena area. That experience is recorded on a separate Zienzele web page. 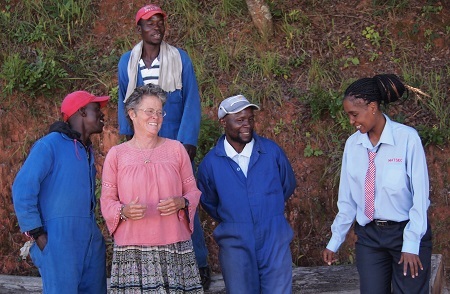 See Zimbabwe Part 2: The Zienzele Foundation.